• Annual publication of declarations of wealth, incomes and expenses of high level officials and judges on the day they take office, and for each consecutive year. The database includes information about 149 Members of Parliament; 38 previous and current members of the Council of Ministers; 65 Mayors holding 2011-2015 mandates and 58 Mayors elected on 21 June 2015; 70 Judges of the high level; Chairs of Constitutional Institutions in the country, and 43 Ambassadors of the Republic of Albania. This well-structured database enables the citizens to learn and inquire about the wealth, economic interests, elements of nepotism, or conflict of interest involving high officials or members of their families. • Well-structured data about all the transactions of the State Treasury for State Institutions. Publication of a total of 258 996 transactions for 1620 public institutions, 9002 beneficiaries, and 321 categories of expenses. This database is made available in the SQL format and enables monitoring and control of every expense involving public money, identifies the clients involved, and expenses by destination, and answers the question Where does my Money go? • Concession Agreements and Public Private Partnerships (PPP) are liberal models of public policies intensively applied by the Albanian Government in 2015. 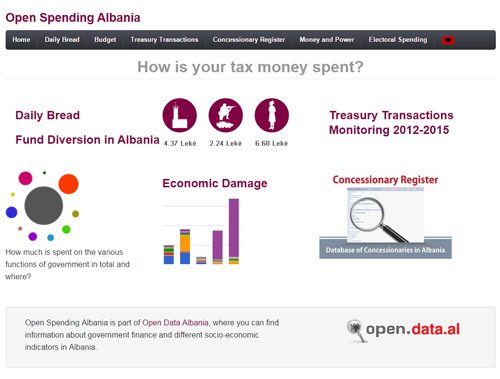 The Spending Data Albania portal opens data about 66 Concession Agreements. Some of the most controversial agreements for 2015 are those made in the areas of public health, railways, and public works. 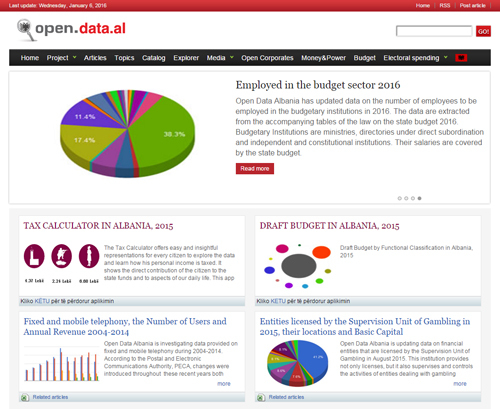 • Open Data Albania portal for 2015 opened data about the Albanian economy and society. A special emphasis was paid to the various indicators about local government, individual and household consumption, poverty, and allocation of resources to groups with special needs like the politically formerly prosecuted, gender-based, etc. A total of 150 investigative articles were published in 2015 containing open data focusing on Fiscal Transparency and Public Finance Management. • Open Corporate Albania is a well-structured information dataset containing data about 1362 business companies operating in Albania. Every company has its own passport, containing information about its shareholders by their capital and quota, administrator, seat, activity or economic sector, incomes and annual turnover, and registered accountants. This data structure was established in 2015. AIS is in a process of fund raising to ensure the opening of data for more companies, and mainly companies, which have signed contracts with public institutions. • Make Elections Count! That was the slogan of Za’Lart Albania (Raised Voice) ICT Project for fair Elections. The program worked as a crowdsource (USHAHIDI) platform, where citizens were invited to report the problems they observed during the electoral campaign and on the voting day (21 June 2015). Through Za’Lart, the citizens monitored and reported cases of vote-buying, misuse of the public administration, intimidation of first-time voters, or discrimination of voting rights of vulnerable voters. The Civic Voice Civil in Albania brought some clear facts about the criminal records of some people, who were involved in the electoral campaign, and exaggerated electoral spending and problems with the voter lists where incumbent mayors reran for one more mandate. A group of volunteers covered the whole country to unite and strengthen the civic voice for fair elections. Za’Lart Albania 2015 was enabled in the framework of an initiative of the Electoral Situation Room 2015, a group of several Albanian organizations, for monitoring and reacting on the elections through the local players. The platform worked as a Web and App Mobile. • Enabling European e-Participation was the motto of several events organized in different countries of Europe by member organizations of Telecentre Europe in the framework of e-UROPA AIS organized e-Participation Day for the first time in Albania; the local My e-Participation Story Contest brought a European and National e-Participation Tools Brochure in the Albanian language. • Transparency with Electoral Financing. This was AIS advocacy theme for 2015. 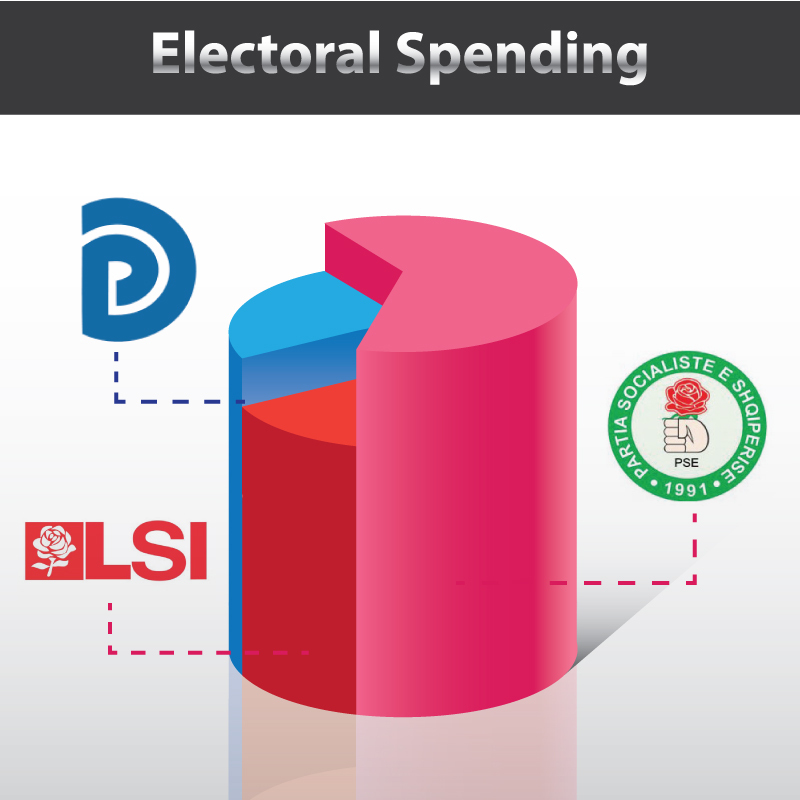 The organization addressed the three main electoral subjects during the electoral campaign, the Socialist Party, Democratic Party, and the Socialist Movement for Integration (three largest political parties in the country) asking for information about their donors and electoral spending. The request was never met, and the campaign took place with the electoral subjects never disclosing information about their donors and the interests they represent. Wishing for transparency, AIS initiated a court appeal asking the Court to force the political parties to ensure transparency about their donations in real time, as required by the Constitutional Law. The process is pending a decision of the Administrative Court of Appeal. • Journalists have been our partners in ensuring transparency, accountability, and participation even during 2015. 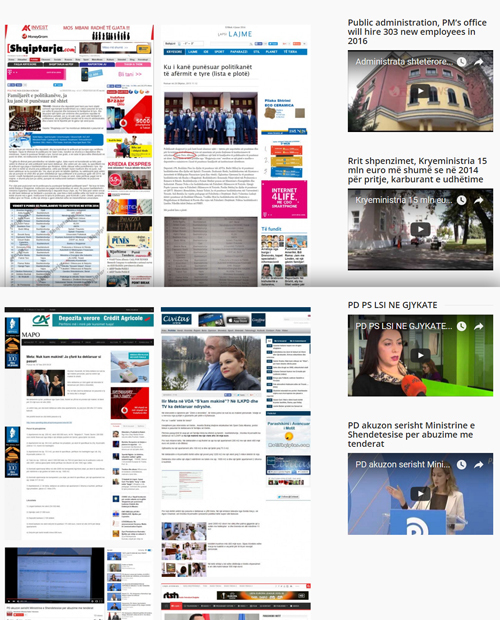 The data published on our portals, Open Data Albania and Spending Data Albania, and are used at a level of 90% by the print media, online news agencies, and TV programs. Fact-based journalism has initiated hundreds of stories on the front pages of newspapers and on the most prominent TV programs. Only the data opened as part of the Money, Government and Politics Program are quoted every month by about 50 media articles. Based on the information opened in the Spending Data Albania portal, media denounced the irregularities found with some Concession Agreement calling for public pressure, immediate auditing, or cancellation of some of them. Likewise, through the Treasury Transactions section, journalists have monitored cases of conflict of interest, where companies owned by high officials or their family members have benefitted public money and public contracts. The media has also echoed the efforts of our organization for more transparency, reflecting also the exaggerated electoral spending, raising questions about the money used for electoral campaigning, and whether that money is generated from crime or corruption. AIS mission is closely related with empowering reactive citizenship and ICT for Social Solutions. To this end, the organization conducted several events in 2015 to empower the civic actors. • Again this year, Hackathon Albania encouraged young boys and girls talented in designing, applications and analysis to work for applications and analysis based on opening of data. • Journalists were trained in May on the Right to Information on Election Financing and Legal Regulation Issues. • More than 100 local volunteers were trained during March-June 2015 on the use of ICT for Fair Elections. We would like the thank the donors, who enabled us to carry out our projects for 2015: The Embassy of the Kingdom of the Netherlands in Tirana, the Open Society Foundation Albania OSFA, the National Endowment for Democracy NED, the US Embassy in Tirana Democracy Commission Small Grants, USAID through Assist Impact, Europe For Citizens Program, etc. In the beginning of 2016, AIS is in process for raising funds for two of its programs: Open Data for a Locked Communist Country and Phase No. 2 of Open Procurement Albania.